The incredible story of genius musician Wolfgang Amadeus Mozart, told in flashback by his peer and secret rival Antonio Salieri – now confined to an insane asylum. Happy people are pleased by the happiness of others. The miserable are poisoned by envy. They vote with Gore Vidal and David Merrick, both credited with saying, "It is not enough that I succeed. Others must fail." 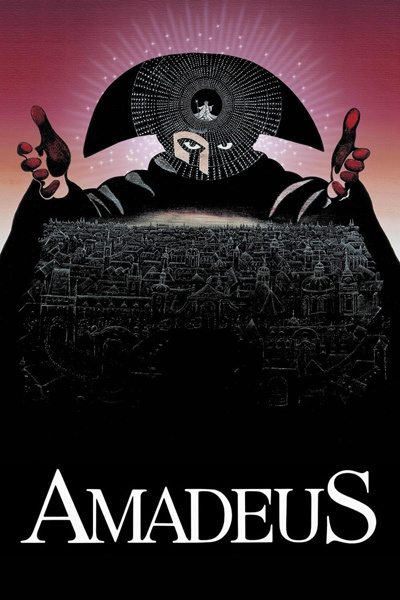 Milos Forman's "Amadeus" is not about the genius of Mozart but about the envy of his rival Salieri, whose curse was to have the talent of a third-rate composer but the ear of a first-rate music lover, so that he knew how bad he was, and how good Mozart was. The flower child Mozart tries to govern his life, unsuccessfully, by the lights of three older men. His father Leopold (Roy Dotrice) trained the child genius to amaze the courts of Europe, but now stands aside, disapproving, at the untidy mess Mozart has made of his adulthood. His patron, Emperor Joseph II (Jeffrey Jones) passes strict rules (no ballet in operas!) but cannot enforce them because, God love him, he enjoys what he would forbid. Then there is Salieri (F. Murray Abraham), who poses as his friend while plotting against him, sabotaging productions, blocking appointments. The irony (not least to Salieri) is that Salieri is honored and admired while Mozart is so new and unfamiliar that no one knows how good he is, except Salieri. Even the emperor, who indulges him, is as amused by Mozart's insolence as by his art. In a film of grand gestures, some of the finest moments are very subtle. Notice the way Jeffrey Jones, as the emperor, balances his duty to appear serious and his delight in Mozart's impudence. Watch Jones' face as he decides he may have been wrong to ban ballet from opera. And watch Abraham's face as he internalizes envy, resentment and rage. What a smile he puts on the face of his misery! Then watch his face again at Mozart's deathbed, as he takes the final dictation. He knows how good it is. And he knows at that moment there is only one thing he loves more than himself, and that is Mozart's music.